I’ve finally done it! I’ve reached a dividend cash record that I’ve been working towards for years! This month’s new dividend income report is here and I’m excited to share! I’m sure you can already tell… I’m thrilled to report the dividend income progress I’ve made this month. It’s taken a lot of work, time and money to make this happen. While this month’s report is more of a beginning then an end to reaching further goals, it is something I’m very proud to have finally achieved. This month I received $1,027.85 in dividend income. On average, I was paid $21.86 from 47 fantastic companies. I absolutely love having 47 passive income jobs with some of the best run companies in the world! We once again have a huge monthly dividend income increase. 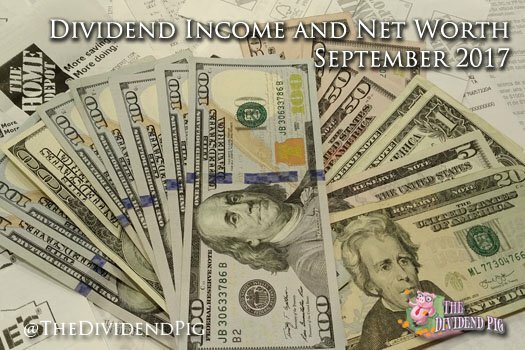 This month’s dividend income is a 127.13% increase over September 2016. This type of increase will allow me to reach my goals of early retirement in just a few more years. It’s a huge increase and a gigantic sum of dividend cash to receive for doing nothing… zero work! Being a dividend income investor is the best job in the world. I can’t wait to be able to do this full time in a little less than 5 years! September’s dividend cash covers electricity, gas, internet, groceries and dining out. 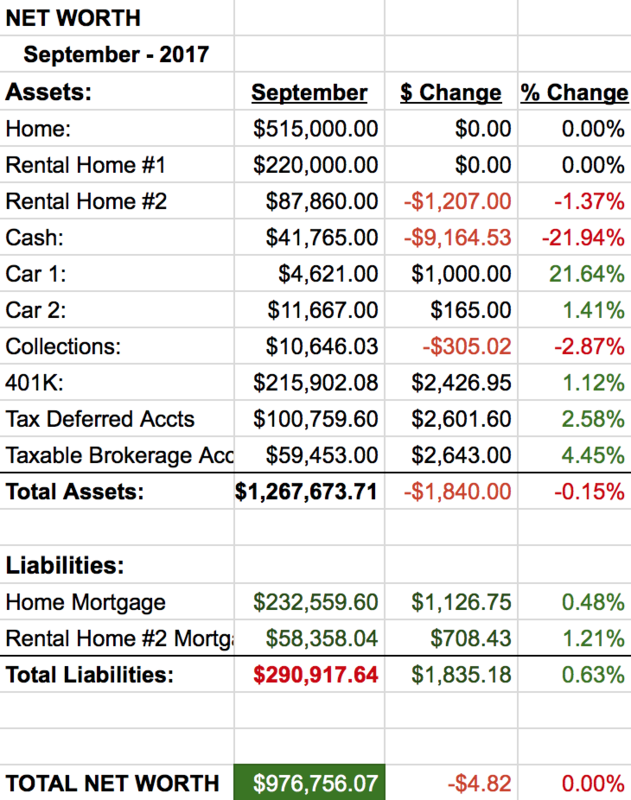 Pretty much all of my larger expenses outside of the mortgage. Cash got smashed this month after investing in upgrades to get rental property #1 ready for sale. However, overall net worth pretty much stayed flat. Another huge cash decrease this month. This time the money was used to invest in rental property 1 to get it fixed up to sell. It’s funny, I would never spend this kind of money on my primary home, but I’m happy to shell it out for the CHANCE to sell my rental property for more. Here is where it all went. Brand new kitchen appliances – $7,500. We bought them on sale from HD and “saved” a little over $1,000. We also purchased new fancy granite countertops for the whole unit for about $2,500. We also changed all the lighting in the unit to LEDs and painted all the walls. The place looks great. We are now planning on listing the unit for 250k. As I mentioned above, we are selling rental property #1. Our hopes are to get roughly 250k for the property and we would like to net roughly 230k. There are a lot of variables that will go into that. First, our agent is a friend and I hope to only be charged 1.5% on the selling agent side. That hasn’t been “worked out” yet, but I’m pretty sure it is possible. Also, 3% from the buyer’s agent takes a large chunk of cash as well. Ugh. On top of that, we have been deprecating the rental property and that will come back and eat some additional cash. I just don’t know how much yet. However, these are all pie in the sky numbers at the moment. Perhaps nobody will like the unit or, maybe everybody will like it and there will be a bidding war (cross your fingers for me). We’ll know more once all of the rehab is done next week. The money from this sale will most likely go into paying off my loans. While I understand this isn’t maximizing my earning potential for this windfall of cash, I am getting a guaranteed return of 3.5% (my mortgage interest rate). I’m okay with that! And, I’ll be more mortgage free. I suspect the level of freedom not having a gigantic mortgage payment do every month will be extremely liberating. This month’s dividend income increase truly shows that what I’m trying to do is working. I mean, I made over one thousand dollars this month for doing nothing! On top of that, rental property #1 is almost ready to list and hopefully that will go as well as planned and I’ll be mortgage free! Now, as to where I think we are going in the markets. The Fed will begin to reduce their balance sheet this month. Apparently, by 10 billion and will ratchet that up to 50 billion in the following months. This should put some pressure on the markets and interest rates should begin to rise. That will certainly be welcome to us dividend investors that would love some better values. However, those better values will come from a reduction in stock prices and we are going to see a lot more red days ahead. For all you folks that trade forex and focus on the USD, this should also be welcome news. Typically higher interest rates appreciates the base currency. There should be some good opportunities approaching. I still have plenty of cash and will be anxiously awaiting a correction. It would be great to see a 5-10% correction this October, but only time will tell. Did you break a monthly dividend income record? Do you think we’ll see a correction this month? Congratulations Blake! Achieving this goal is the result of your past dedication towards it. Certainly worthy of a celebration. It is great to get that first 4-digit dividend total in a month! Congratulations! September was another record-setting month for me. I just love quarter-ending months! Thank you very much! I’m with you, these big payday months are definitely my favorite as well. One of the best parts about being an active dividend growth investor is that there are so many small victories to celebrate! Thank you for dropping in, its always great to hear from you!